Tokyo has a lot of charms. From its modern architecture to historical temples and shrines, local lifestyles on backstreets to wide and open sidewalks. 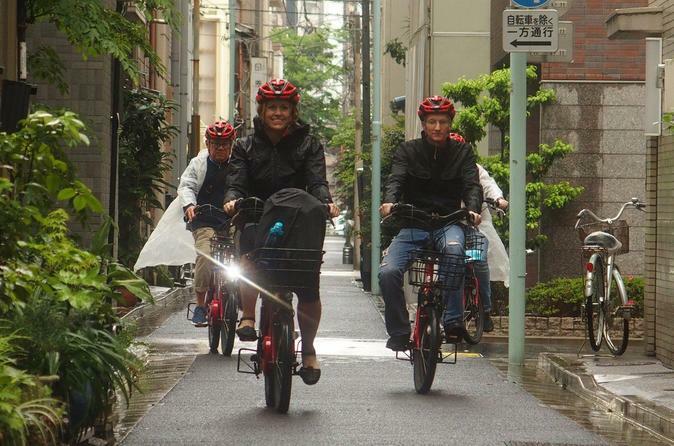 In this tour, you will explore Tokyo with E-assist bike and professional guide. Explore Tokyo's deep route, knowledge and inspirations on a one way concentrated 3 hours bike trip, with Pedal assist. You will visit the hidden spots not listed on the guidebook and places that are hard to visit by public transportation. The backstreets and the local atmosphere awaits you. Visit the famous Tokyo spots with routes of locals. E-bike will assist your journey, so there is no need to worry about physical fitness and the up-and-down of the slope. Explore the backstreet, enjoy local foods, and feel the local atmosphere. The best part of this tour is that you will visit places where you cannot reach on your own. If you have a specific place/area to visit, feel free to let us know so that we can include in the route. Even if you do not, our guide will recommend the tour route. Of course, the famous spots like Asakusa or Meiji-jingu shrine are available to arrange. *E-assist bike will help your journey, so there is no worry about physical fitness and up-and-down of the slope. * Experienced bike tour offering the unknown Tokyo. * All the tours are different. Not just when but the theme itself. * Connecting routes bikes would enjoy. End: - Otemachi near Tokyo Station. (Under 18 years old: 5,400 yen ) *Parents must be accompanied. *Please inquire us for the detail.